Engaging industry stakeholders and encouraging new advocates is a key part of the Issues Management program to tell the beef production story. 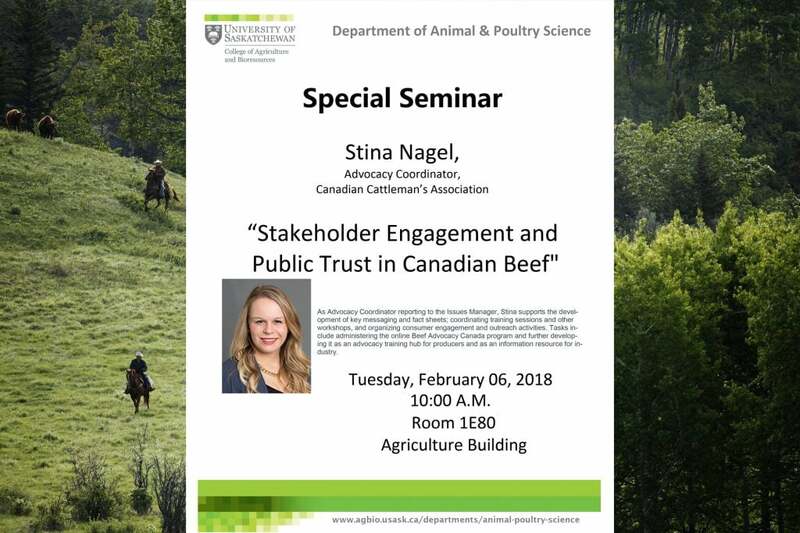 The University of Saskatchewan in Saskatoon was a welcome host to Advocacy Coordinator Stina Nagel February 5 and 6 for two speaking engagements on industry stakeholder engagement and public trust in Canadian beef. Nagel first presented as a guest lecturer to a class of cow/calf management students who had been given an assignment to write a press release on an industry issue. Walking them through a case study on how industry staff would handle this task and the considerations of research, government policy, and public perception, she was able to illustrate not only provide pertinent information to the assignment, but provide information on potential beef industry careers and encourage students to become advocates. Nagel also presented to the wider faculty on public trust in Canadian beef and the role that academics play in telling the production story.